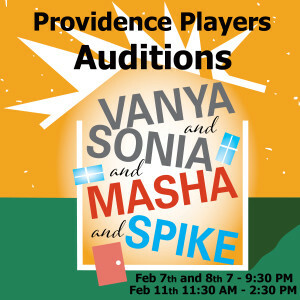 The Providence Players will hold auditions for their upcoming production of Christopher Durang’s Tony award winning comedy, Vanya and Sonia and Masha and Spike, on Tues, Feb. 7th, Wed, Feb. 8th & Sat, Feb 11th at the James Lee Community Center at 2855 Annandale Rd Falls Church. On the 7th and 8th, auditions will be held from 7 to 9:30 PM. On Saturday February 11th, auditions will be held from 11:30 AM until 2:30 PM. Call Backs (if needed) will be incorporated into the February 11th audition time. The production will be directed by Jimmy Gertzog. There are 6 roles – 4 Women 2 Men. All roles are open. Please RSVP your intentions to audition to the email address below. The Tony Award winner for Best Play of 2013, Durang’s hit comedy skewers the classic dramas of Chekhov through an absurdist tale of family dysfunction. But you don’t have to be a student of Russian literature to appreciate this hilarious play. Siblings Vanya and Sonia live a quiet life in the Bucks County farmhouse where they grew up. But when their movie-star sister Masha swoops in unannounced with Spike, her 20-something boy toy, an unforgettable weekend ensues. Add a clairvoyant cleaning lady, someone named Hootie Pie, a sweet young aspiring actress, and plans that could devastate the family, and you have a laugh-out-loud stage offering that will be a sure-fire audience favorite. Auditions will be held in several different rooms at the James Lee Center. Proceed through the main entrance and ask for directions from the front desk. Signs will be posted. Please RSVP to providenceplayers@cox.net for the date you plan to audition. PPF does not work on an appointment/time slot basis. Choose your preferred date to attend, plan on staying for the full audition period (or as much of it as you can)– you will be given a number of opportunities to read throughout the audition session. We will NOT be having actors audition on multiple dates, barring unforeseen circumstances and at the director’s discretion. Open auditions, all roles. Readings from sides provided (see below). Possible callbacks TBD by the director will be held on the 11th. Note: Feel free to review a personal copy of Vanya & Sonia & Masha & Spike prior to auditioning, however this is not required. Do come prepared to be up and down multiple times, have fun, be flexible, and take some basic instruction during your auditions! These words very neatly encapsulate the plays of Christopher Durang: themes for audiences and performers alike to remind themselves of even as they laugh at the absurdities portrayed within. In actuality, the quote was said by biographer and literary scholar Robert Payne of Anton Chekhov, the late 19th and very early 20th century Russian playwright and innovator of the modern short story. Yet they hit the mark a century later for the accomplished comedic author. It is no surprise for Durang to have written a play that is an homage, a reinvention, and a refraction of a definitively Chekhovian environment. Vanya and Sonia et al is an overt citation of Chekhov’s most famous characters and settings, but the characters within are also living the same types of stale, vainglorious, unfulfilled lives. Durang’s play is a comedy, but it is funny and absurd because the alternative is a sorry recognition of our own meandering regrets. Vanya (male, 50s-60s; the elder brother). Wry, retiring, frustrated, resigned fellow. Vanya et al is an ensemble piece, but the closest to a lead role is Vanya, who acts as the peacemaker in the family and has the most stage time. He also has a pages-long eruption of a monologue at the conclusion of the play. He is gay and lives with his adopted sister (‘together alone’) in the house of their childhood, having cared for their parents until they passed, supported financially by their sister. He never had to work and was complicit in letting his life slip by without making much of it at all. Sonia (female, 50s; the adopted sister). Melancholic, capricious, definitely regretful, possibly desperate. A mirror image of Vanya except less resigned and more prone to manic outbursts and accusations for her state of being. She also maybe has/had a clearer image of what she wanted from life. Sonia and Masha have a raw, contentious hostility toward one another that comes out as the play progresses. May be the one worth the most sympathy. Masha (female, 50s; the famous sister). Expansive, glamorous, haughty, frenetic. A successful and well-traveled actress, often married, Masha returns home to her siblings having found herself on the edge of “once beautiful.” Her self-deceptions are worn more on her sleeve than either of her siblings – see the flirtatious, empty-headed young companion she brings home with her. She returns to the homestead with intentions to sell it out from under her siblings, but really, she might not have had anywhere else to go. Spike (male, 20s or early 30s; Masha’s ‘companion’). Chiseled, flippant, devil-may-care boy toy. A preening millennial, Spike is a young actor who pays just enough attention to Masha to keep her satisfied. He does not seem to have any urgency for anything, despite the fact that he has little to show for his career thus far. But he’s got his looks, a captive audience, and believes the rest will be laid out all on a plate for him when the time comes. As fair warning, Spike does disrobe down to his underwear in the play, and maintains that status for several pages on stage. Nina (female, 20s-30s; aspiring actress). Earnest, bouncy, a guileless admirer. An accidental arrival on the scene, Nina is the neighbor’s niece who has dreams of becoming an actress and has the (mis)fortune to stumble into her idol Masha. Her appearance though provokes lust in Spike and, unsurprisingly, envy in Masha. Cassandra (female, flexible; soothsayer housekeeper). Obtrusive, kooky, dramatic. A true wildcard, gem of a comedic role, Cassandra is aptly and unambiguously named: she is a psychic prognosticator that no one believes but speaks the truth (mostly). She is also the housekeeper and somewhat of a caregiver to Sonia and Vanya. Her sudden, wild pronouncements for the future offer a lot to play around with for the adventuresome actress. I am truly open to most anything brought to the table for this character. Our goal is to provide a welcoming, relaxed, and engaging audition environment for all who attend. Audition sides will be provided and you will be asked to act out short passages with other auditioners. Count on being up and down multiple times. At times, we may even have you read outside of your preferred role, just to see you on stage and interacting with your peers as much as possible. In addition to the director, there will likely be 2-3 other volunteers assisting and communicating with the director to organize ensuing sides & groups. Space permitting, you will be allowed to watch all the auditions. We try and make is as relaxed and fun as possible. Brief 2-5 minute audition sides are provided here and at the auditions. You will not be expected to recite a monologue. Additional sides may be included at auditions. The Providence Players of Fairfax have a few expectations of their cast & crew members that you may be unfamiliar with. We are a family of volunteers and truly want to see this family grow with each production. You all make our season possible. Please do consider joining our production team in some capacity – and consider learning something new! Our production participants usually end up rolling up their sleeves in some capacity before the final curtain closes. We request that all cast & crew members to be available for BOTH set construction (4 weeks prior to opening) and set strike (the Sunday a.m. after closing). Resumes and headshots will be accepted at auditions, but are not required. Most important is that you fully complete the attached VSMS Audition Form – especially with preferred contact information and expected scheduling conflicts – and bring it with you to your audition, or come early enough to auditions to complete it in-person. The Providence Players of Fairfax is an all-volunteer membership organization. You are not required to be a member to audition, but cast and production members will be asked to join if they are not already. The cost is $10 for the entire ’16 – ’17 season. The preliminary rehearsal schedule is included with this announcement. On-stage rehearsals officially begin May 2nd, however expect there to be table sessions and additional rehearsals 1-3 times per week for at least a month prior, for some or all cast members. Again, please come to auditions with known scheduling conflicts in hand. 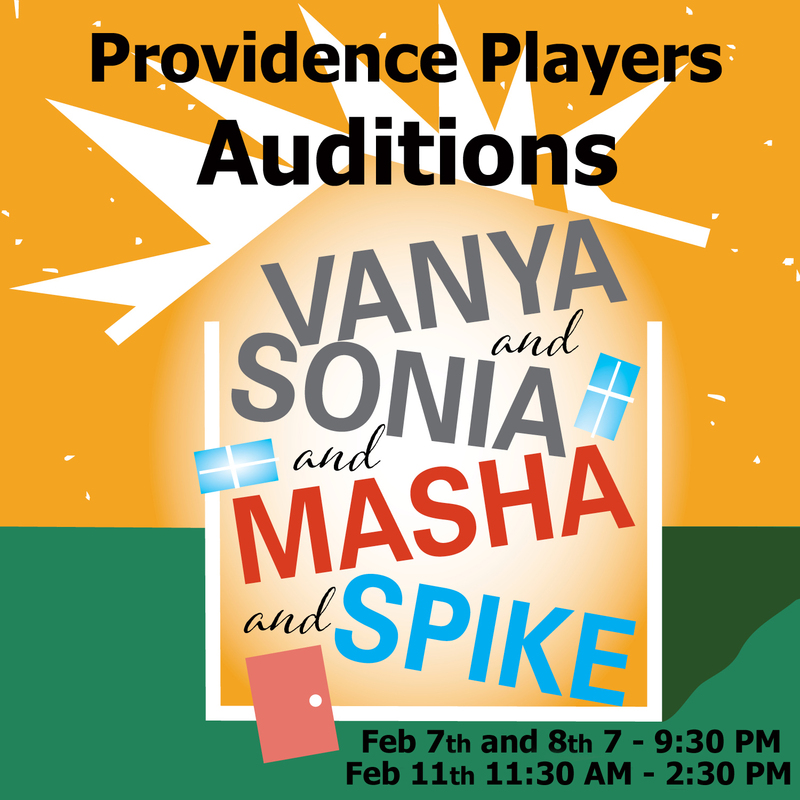 Vanya and Sonia and Masha and Spike will be the second venture into directing a mainstage production for Jimmy Gertzog, but he has been involved in community theater and the Providence Players for over 15 years. His directorial debut came in 2012 with a production of Warren Leight’s Side Man. Before directing he was primarily engaged in the technical side of productions, serving as technical director, lighting designer, sound and special effects design, and stage managing. He has also taken a few turns on the stage as well, including as the primary puppeteer in PPF’s 2013 musical Little Shop of Horrors. Outside of the theater, Jimmy is pursuing his graduate studies in Linguistics. His varied skills and experience give Director Jimmy Gertzog a holistic approach to production direction and an interest in exploring the language and literary depth of theatrical works.